IRVINE, Calif., May 9, 2018 /PRNewswire/ -- Phoenix Audio Technologies today announces their attendance at 4 tradeshows in the next 30 days. Famed for its experiential approach, 2018 will see the Showcase evolving, presenting the future of display solutions with fresh new experiences. Throughout your working day from your grab & go coffee as you board the train to your customer meetings, you experience a series of engagements. NEC Showcase LIVE recreates this daily journey, enhancing these engagements through technology. 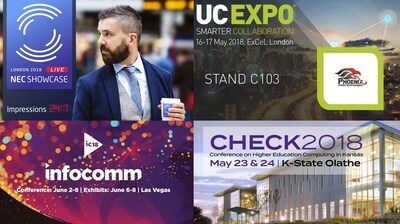 For the very first time, Showcase returns to a previously enjoyed venue to take advantage of the superb central location which offers unbeatable transport links and access to all the diverse attractions that London has to offer. Stop by Stand C103 to meet with Bob Farahar and Ryan Root to get the latest on audio endpoints for the modern-day collaboration space. This year, Phoenix Audio Technologies is empowering their partners. Stop on by Booth N746 and you can expect to meet with four exceptional AV Integrators from all over the United States. Partners in attendance: Perfect Video Conferencing, Conference Room Systems, Alpha AV, and System Technologies Inc. The Conference on Higher Education Computing in Kansas (CHECK) is an annual gathering of information technology professionals in post-secondary institutions in Kansas to present, discuss, and learn about new technologies and current issues in providing IT services to the higher education community. CHECK is sponsored by the Regents Information Technology Council (RITC) and coordinated by the Information Technology and Services Advisory (ITSA) subcommittee. Hosting the event rotates among the member institutions. 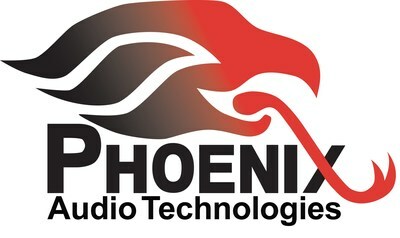 Phoenix Audio Technologies will be presented by Kansas City Audio Visual. For over 64 years, Kansas City Audio-Visual has served the business, education, government, and religious market with the latest in presentation and audio-visual resources. We represent over 100 manufacturer's product lines which allow us integrate solutions that are designed to accomplish your goals. At Kansas City Audio-Visual, it's the client application and opportunity which drives the solution. Technology and hardware, combined with comprehensive support before and after any sale, result in client satisfaction.